On this occasion, we want to analyze a situation we are going to face very often in the face-up version of our Pyramids - Tripeaks Solitaire game. Here is a picture as a background. 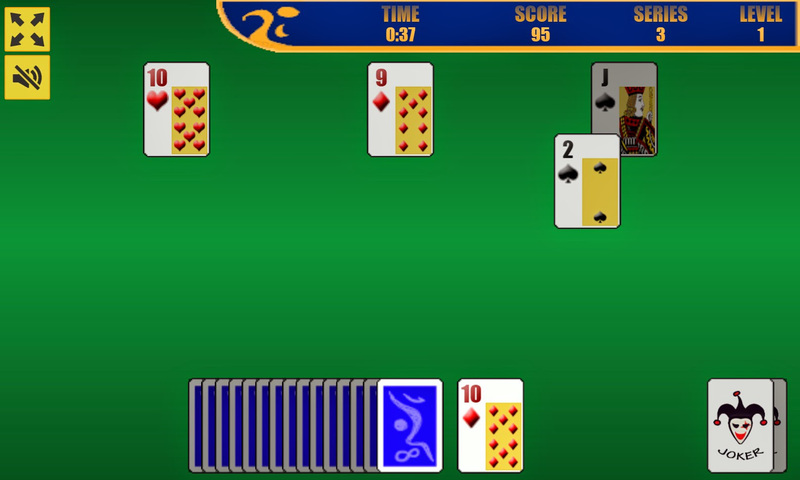 Option 1: Remove the 9 of diamonds and then the 10 of hearts. Given that we have accumulated a series of 3 cards, we will get 4 and 5 points respectively, plus the bonus for being peak-of-pyramid cards. Later, when we remove the 2 remaining cards, since it is not possible to make a series with them, we will get only 1 point per each, plus the bonus because of the J being a peak-of-pyramid card. In total we would add 4 + 5 + 1 + 1 + 10 + 20 + 30 = 71 points. On the other hand, it increases the risk of having to use a joker to remove the J, as only 2 card values are useful: 10 and Q. Option 2: Put new cards in game until the 2 of spades is removed, and later make a series to remove the 3 remaining cards. That way we will get 1 point with the 2 of spades, and 1 + 2 + 3 points for the series with the other cards, plus their respective bonus for being peak-of-pyramid cards. In total they would be 1 + 1 + 2 + 3 + 10 + 20 + 30 = 67 points. We would lose 4 points, but it would be more likely to remove the J without using a joker, since once the 2 of spades is removed, 3 card values are useful: 8, 10 and Q. In ludado we would choose the second option. Not using the jokers is a priority for us. An extra card value may not seem much, but taking into account that there are 4 suits per card value, we are talking about 12 useful cards in the second option against 8 useful cards in the first one. Only a much greater difference of points would keep us from trying to maximize the chances to save all the jokers. In addition, we must remember that, if we keep the jokers, extra points are added when a level is completed.